Golden Delicious Apple Bit Wipes are a fabulous followup to Peppermint Bit Wipes. Like the Peppermint, our Golden Delicious Apple Wipes are made with a gourmet flavoring used in candy and ice creams. (at $129/gallon it's the best!) 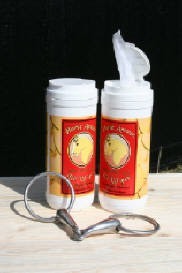 This flavor is so strong and appetizing, it will have your horse reaching toward you as soon as you open the canister! I have a mare that is extremely difficult to bridle, even with Peppermint Bit Wipes, and she immediately turned to me when I presented the newly opened Golden Delicious Apple Bit Wipes canister-- and gobbled up her bit. Unbelievable! You simply must give these a try if you are experiencing bitting problems! Although Bit Wipes originally were created for cleaning purposes, I myself will now sing the praises of Bit Wipes for bitting purposes, with the addition of this flavor. Horses LOVE it!! Since Golden Delicious Apple Bit Wipes have only been on the market since February 15th, 2007 they are truly BRAND NEW. If your favorite retailer does not yet stock them, have them give us a call at 802-468-2200, today!! !